Up first is a Russian Orthodox Church. 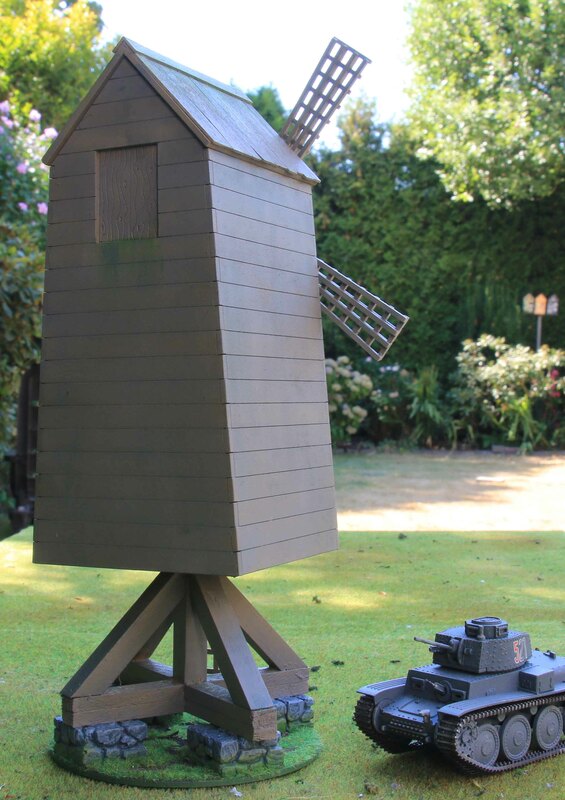 Now these days there are a number of extremely nice MDF kits out there and I would be hard pressed to decide which one to use, but back when I decided to beef the numbers up there were none. 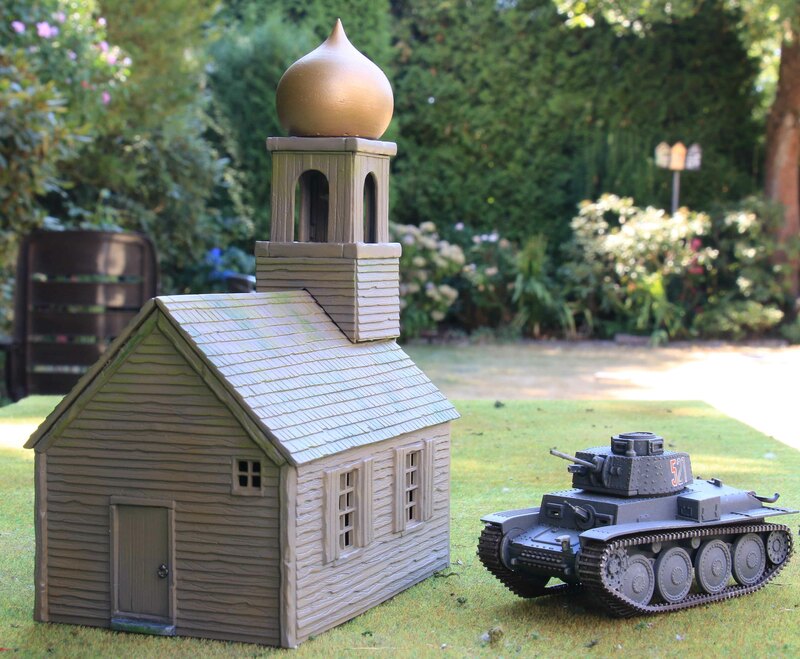 So I decided to take a different route and use the Perry’s ACW plastic Church kit. I scraped off the Christian cross above the entrance, which sounds easier as it was without damaging the wooden planks, and replaced it with one laser-cut from MDF. The cross is by a small UK company. Unfortunately I can not remember their name to give them credit. The regular roof on the bell tower was left off and the resulting square hole shut off using a piece of plastic card. 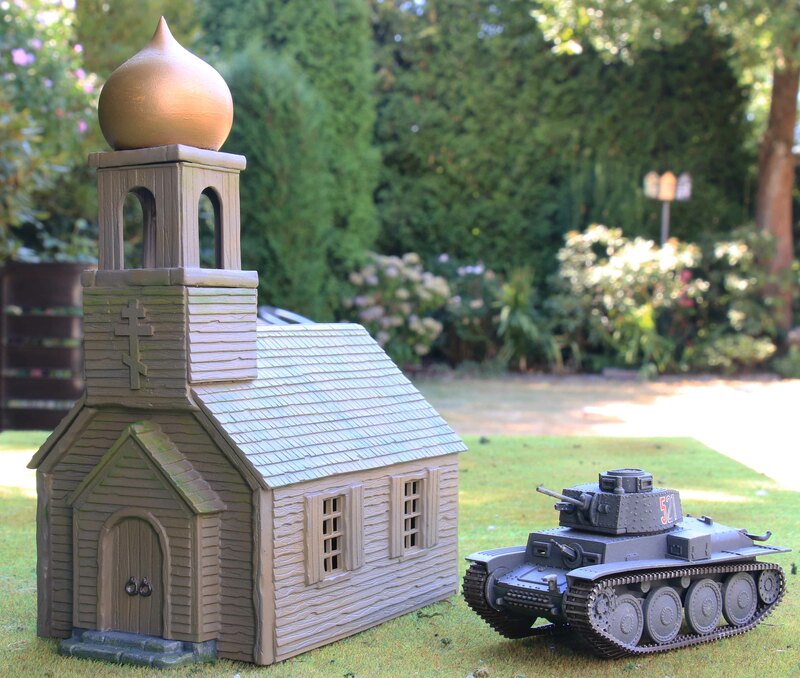 The onion shaped dome is from Fenris Games. All that was left to do was paint it. In real life there is more contrast to the wooden planks and also some greenish stains, but it seems the natural light when so took the photos nearly soaked that up (same also applies to the other buildings in this post). Up next is the windmill. In a way this is kind of a kitbash as well. 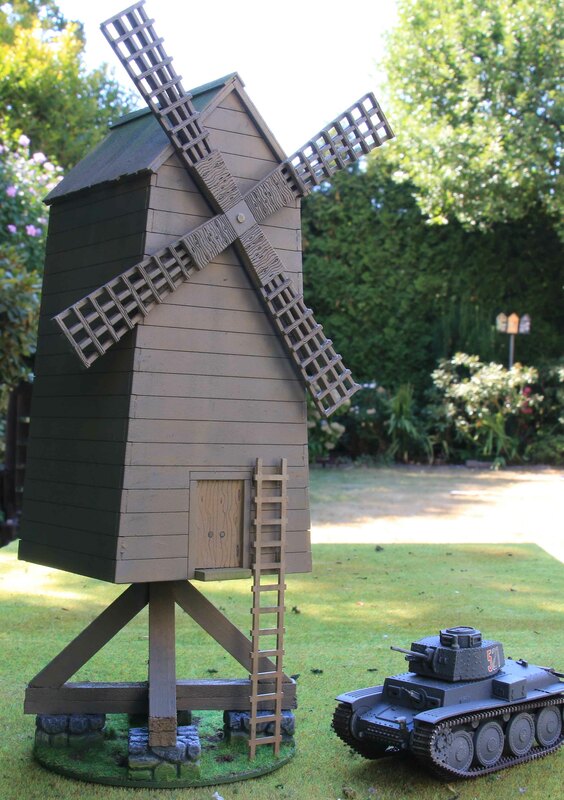 The basic windmill is by Warbases. I replaced the original tool with coffee stirrers, since I wanted a real simple roof there. Since I wanted it to be raised and of a kind that was able to turn with the winds I constructed an under structure from wooden strips and Hirst Arts stones. To make it all accessible I added a ladder from the same company that provided me with the Orthodox cross. I know a set of stairs would probably have made more sense, but this is easier to store and there is a door up on the rear side for lifting goods into the mill anyway, so a ladder had to do. Up Last are two razed buildings. These are extremely nice kits from Charlie Foxtrot (you are going to see a few more of their models over my next posts). I really love their chimney stacks. 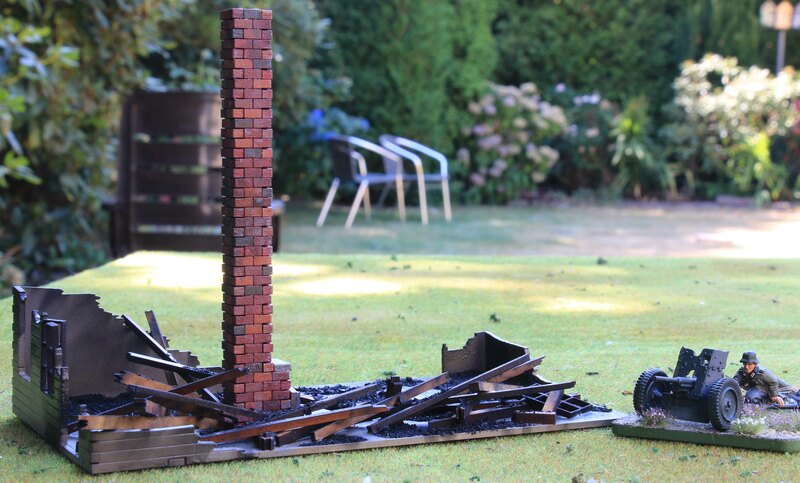 They really add something to the looks of these burned down buildings. I build these two sets pretty straight forward assembling the buildings and painting them. They come with lots of separate planks and so on to allow you to mimic rubble and I decided not to paint these. Since they were thin strips of MDF they already looked suitably scorched as it was. So these were just filed in after the painting. Now once it was I all glued together this proved to be a mistake, since they looked immensely different from the way I had painted the rest of the buildings. The original plan had been to give the edges of the buildings a quick black spray with the airbrush and give it all a light black dusting to back it blend, but I realised that this would not do the trick. Something else would be needed. 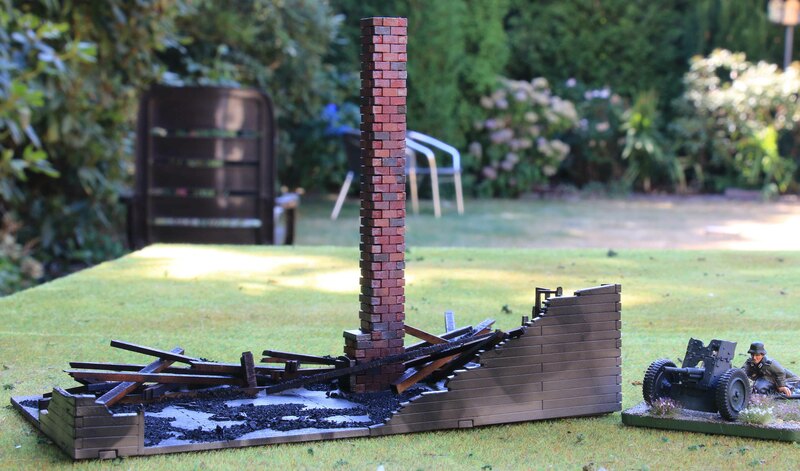 So I treated it all with a candle, making sure it left soot marks over the building and rubble. I also noticed that the floors looked to clean and that there was too little debris there. Thank gods it is BBQ season right now so I took some coal dust from the bottom of a bag of coals, smashed up a small piece of charcoal to get some larger pieces of debris and files that over the floor and debris to enhance the looks. And I feel it worked. 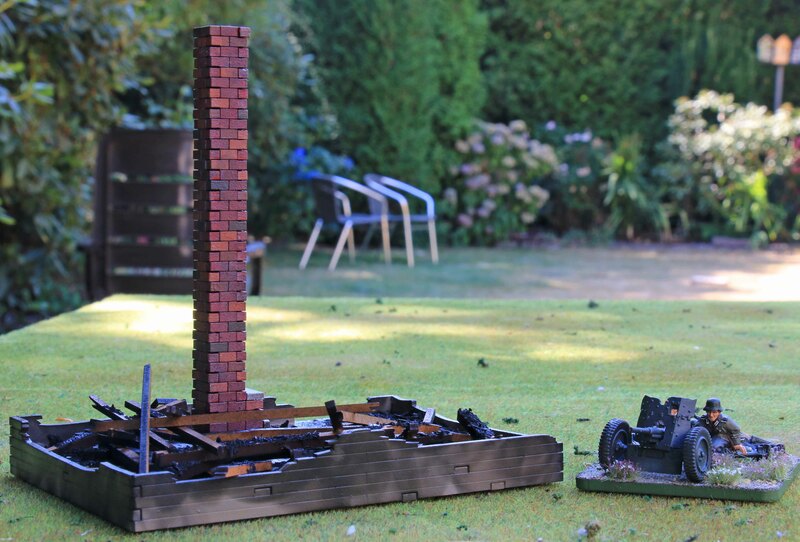 If you want to try this yourselves, please make sure you are working outside or in a well ventilated room (the heat from the candle combined with the paint could cause fumes) and that you have something on hand to extinguish the fire should you overdo it. Also, sealing it all with varnish afterwards is a must otherwise you will smear things and you and other players might get dirty using the buildings.